Share this product and receive a $5.03 sharing discount. 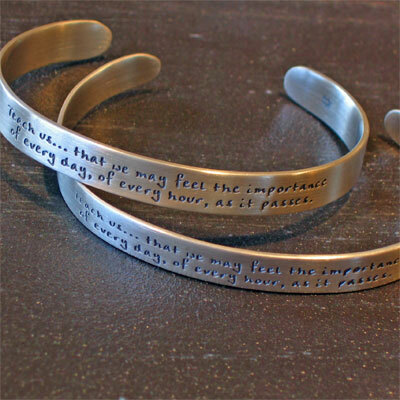 This simply cuff bracelet has been cast from .925 silver and has been engraved with 'Teach us... that we may feel the importance of every day, of every hour, as it passes'. The inside cites the author of the quote - Jane Austen. Jane Austen remains one of the best loved and most widely read novelists in the English language; her popularity founded upon her wit and sense of humor, and a deep knowledge of the human character. This quote was probably adapted from the Holy Bible Psalm 90:12 'Teach us to number our days aright, that we may gain a heart of wisdom.' 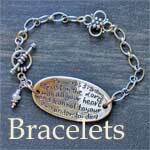 Adjustable, they will fit most ladies' wrists.